I have a Winnie & Walter Christmas card to share with you. Its a easy and quick card to make. I masked the card front panel leaving about 3 inches gap on the top half. Then I sponged Wilted Violet, Blueprint Sketch and Mermaid Lagoon distress inks on the gap. Then I spattered some clean clear water for texture. I also spattered copic opaque white before I removed the masks. I left eh panel to dry while I worked on the Christmas elements. 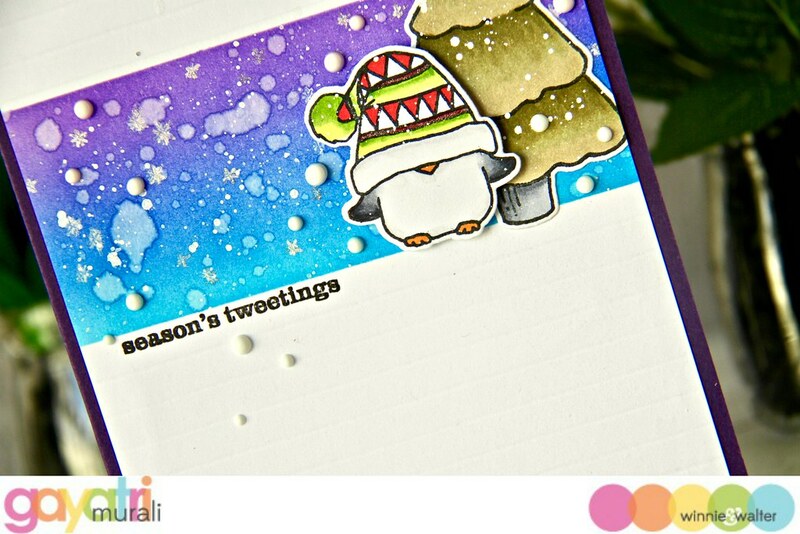 For the Christmas element, I chose the cut bird and tree from Season’s Tweetings with Evelin T Designs. 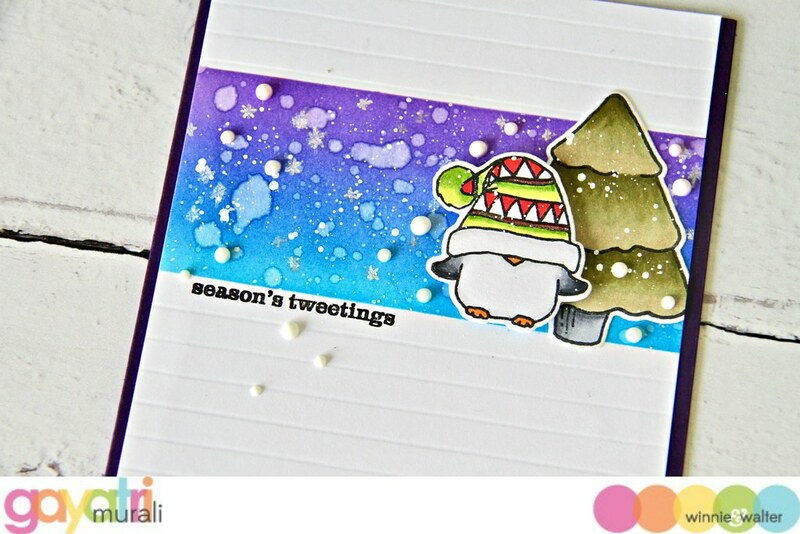 I stamped, coloured with copic markers and die cut using the coordinating cutaway. Then back to the panel, I trimmed the panel to 4” x 5.25” in size. Then scored the rest of the panel to every quarter of an inch to added texture and interest to the card. Then I glued the tree on the right side of the sponged area and the bird image next to it using the foam adhesive. Then I added some stars using Sakura sparkle jelly roll pen all around the sponged area and stamped the sentiment from the same stamp set in black below the sponged area on the left. 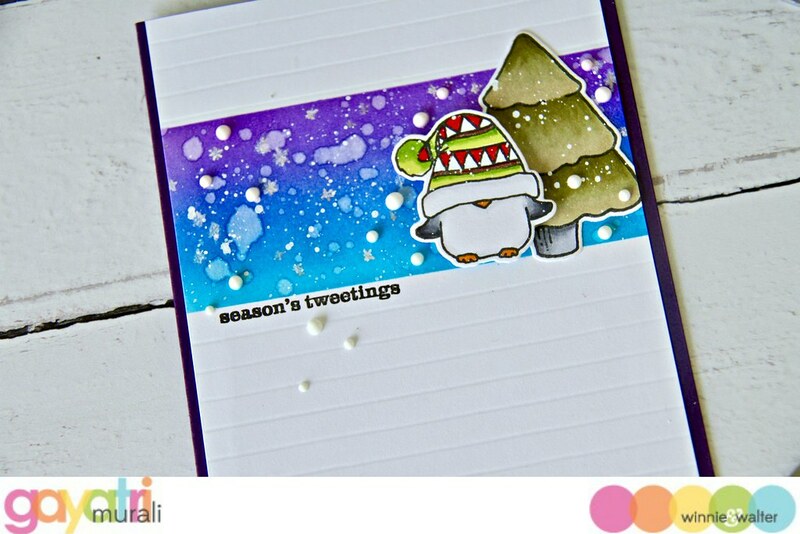 Finally I added a few white Nuvo enamel dots to finish off the card. I mounted this panel on to a purple card base. The purple on either side of the panel ties in with the purple on the sponged area. Hope you like my card for today. Please share and tag if you make one inspired by this project. Gorgeous card, such a cute little fella under his woolly hat. Beautiful clean, crisp image. Thanks for all the information so we can try something to this effect. 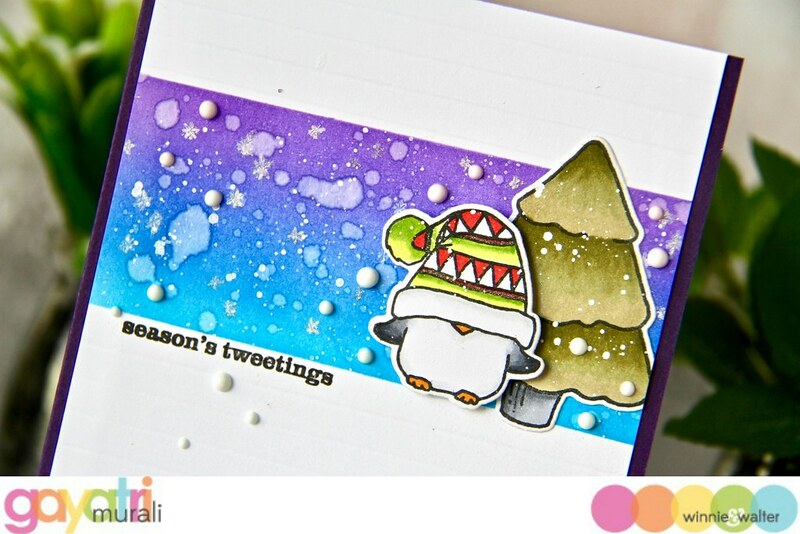 So an adorable little image and gorgeous card!